One more 3 day weekend is here, for grand Vinayaga Chathurthi festival that falls on August 29, five Tamil films gearing up for release. 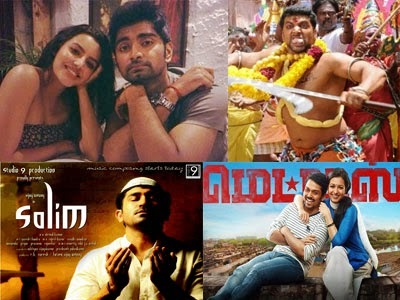 Jayam Ravi-Trisha Bhooloham, Karthi's Madras, Vijay Antony's Salim, Atharva-Priya Anand Irumbu Kuthirai and Parthiepan's Kathai Thiraikathai Vasanam Iyakkam. Out of the five noted films slated for August 29 release Boologam-U, Salim-U/A, Kathai Thiraikathai Vasanam Iyakkam-U completed censors, while Madras and Irumbu Kuthirai still waiting for their turn. Pa. Ranjith directed Madras is an action entertainer under Studio Green production, AGS Entertainments Yuvaraj Bose directed Irumbu Kuthirai is a Tamil drama on bike racers, director Kalyana Krishnan's Bhooloham is an action movie about boxing and Salim is an action thriller while Kathai Thiraikathai Vasanam Iyakkam is 'a film without story'. According to the trade, only two to three films from the above mentioned list can make it to the big screens for festival weekend depending on the result of Suriya's Anjaan directed by Lingusamy with Samantha. Watch the space to know which among the 5 Tamil films make it to the big screens for Vinayaga Chathurthi weekend.